A breakthrough by University of Ulster scientists could transform the production and industrial use of graphene, a powerful and versatile materialthat comes from graphite, the carbon in pencil lead. They have discovered a simple, low cost and environmentally friendly way to bulk produce high quality ‘graphene nanosheets’ from common flakes of graphite and hope to turn their patented process into a commercial success. Graphene is a single layer of carbon atoms arranged in a hexagonal lattice. When scientists first isolated stable graphene layers in 2004, graphene was hailed as the new 'wonder' material heralding a new era in nanotechnology research. Graphene’s unusual electrical and mechanical properties mean that it has many potential uses: it is just one atom thick; 200 times stronger than structural steel; it outperforms copper in conducting electricity; it is almost impermeable; it is so stretchy that a tiny drop could cover several football pitches; it is transparent, flexible and from a readily available raw material – graphite. For all its versatility though, it presents many challenges, not least the cost of mass producing pure graphene, which is why the breakthrough by Ulster’s scientists is so significant. 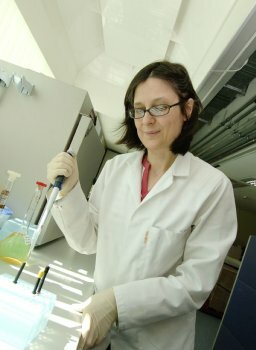 Professor Pagona Papakonstantinou, Professor of Advanced Materials within Ulster’s Engineering Research Institute at the Jordanstown campus, says their discovery could revolutionise everything from new nanoelectronics to construction, to energy storage and generation technologies. Professor Papakonstantino, who leads the Carbon Based Nanomaterials Group at the Nanotechnology and Integrated Bioengineering Centre, explains: “Imagine that graphite resembles a book and each individual page represents a graphene sheet. However, the ‘pages’ are stacked together. So, we grind the graphite flakes with a small amount of ionic liquid to separate each page and at the same time tear each page in even smaller pieces to produce graphene nanosheets. We have found that prolonged grinding in time will produce tiny pieces called graphene quantum dots. Dr Nai-Gui Shang, a researcher at Ulster, adds: "Grinding has been a Chinese traditional way of making ink for calligraphy and painting for over 2,000 years in which ink is produced by grinding the ink stick in an ink slab, mixed with a small amount of water. We thought why not try this with graphite flakes? Here, ionic liquid used as a novel green grinding agent, plays a critical role in the both the good quality and high yield of graphene nanostructures. We believe that graphene nanostructures produced in this way can be applied successfully to inkjet printing of nanoelectronics." The Ulster team holds a UK patent on their invention and is now seekingto commercialise the technology. 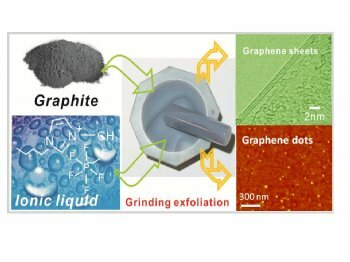 Caption 2Bulk quantities of graphene sheets and nanodots have been selectively fabricated by mechanical grinding exfoliation from natural graphite in a small quantity of ionic liquid.